In less than four years, the women’s umbrella organisation, Kongira Star, has set up an autonomous, grassroots, democratic structure which has resulted in shifting patriarchal mindsets and reversing gender discriminatory laws . . .
On day three of my trip to Rojava, Nuvin and Essam from the media centre take me to the offices of Kongira Star, the umbrella organisation for women, based in Qamişlo [Qamishli], capital city of Rojava. Like all the other cities, Qamişlo, is painted in the colours of a palette made from sand as it responds to the changing light of the sun travelling across the sky. It stands in dusty contrast to the fresh green of cultivated fields and the turquoise of the sky. I am told that by May, when the rains have gone, the green too will turn to khaki. We are stopped by a woman asayish (police officer) on the way, she looks frantically and nervously around the seven seater car. The asayish is made up equally of men and women but there is a separate women-only asayish force which polices sexual and domestic violence against women. Apparently they have information that an ISIS woman suicide bomber is expected in Qamişlo that day. This sort of incident, along with check points as you enter and leave towns, barricades outside official buildings and soldiers positioned on rooftops surrounding large gatherings, are reminders that we are in a war zone. And, unsettlingly enough, Raqqa, capital of the ISIS caliphate is only a two hour drive away. The war situation profoundly affects every aspect of this society: shortage of goods; people emigrating as well as an influx of refugees; an economy on a war footing with meagre resources directed towards defence and survival; and psychological trauma of losing young men and women to the war. However, in the midst of all this, there is a vision and implementation of a democratic egalitarian society that is breath-taking, all the more so because it is taking place in such a difficult situation. For the first time since arriving in Rojava, I feel as if someone has been expecting me. At the border, they asked where I would be staying, when I arrived at the media centre offices I was asked the same question. To my embarrassment, I didn’t know because I had been reassured that once I got to Rojava, everything would be taken care of. At Kongira Star, the women are friendly and warm although no one speaks English so we smile a lot at each other. Everybody smokes, it’s a hive of activity and a woman in military fatigues mingles with them. 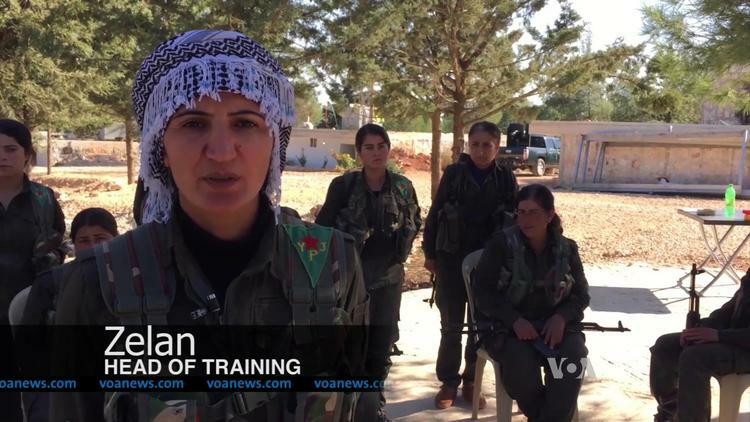 She turns out to be Nesrin Abdullah, a spokesperson and commander in the YPJ (Women’s Protection Forces) who I interview later. Kongira Star changed its name from Yekitiya Star because they decided at their conference in February 2016 to welcome women of other ethnicities (not just Kurdish) into the organisation and needed a new name to reflect the new reality. Kongira Star’s organisational network is deeply embedded across Rojavan society although they were only formally established in 2012. Their structure mirrors the Tev-Dem, the Movement for a Democratic Society, which includes all ethnicities and religions, and is an exercise in direct grassroots democracy. At the neighbourhood level, they have set up communes ranging in size from 7 to 300 families depending on whether they are based in villages or cities. All the members elect a man and a woman under the co-presidentship rule to manage the work and to represent their interests at the next level, the House of the People (Mala Gel), a kind of regional council. The commune also elects members of specialist committees like health, education, services or conflict resolution which will be led by co-presidents. The same structure is reflected in the next level up in city assemblies. Only problems that cannot be resolved at commune level make their way up the structure. The autonomous, parallel women-only structure set up by Kongira Star, with its own committees, which feeds in equally, along with Tev-Dem, to law and policy making, has brought all kinds of women into the public sphere. Women who could not read or write before the revolution have gone to the academies that have been set up and become educated and empowered. They have joined the various committees set up at the commune level; their very presence in the public sphere has transformed how women are seen and a new respect for women’s abilities has permeated every level of society. Not only must Tev-Dem be led equally by men and women, this separate structure implies that women’s liberation is not to be achieved by equal numbers but by tilting the scales in favour of women in order to achieve a level playing field. Halima, a warm and welcoming woman, the matriarch of the first family to host me for the night was illiterate before the revolution but has learned to read and write Kurdish since 2011. While watching TV, she would delightedly read the captions out loud. She started working on conflict resolution in domestic violence cases that came to the House of Women, (Mala Jin), until recently when her knee started troubling her. Although she’d had an arranged marriage and stayed at home to look after seven kids, she was influenced by Öcalan’s ideas. I ask how she came under his influence when she couldn’t read. She says she participated in political discussions with her husband’s friends who came to the house. I later find out from my interpreter that these “friends” are really PKK (Kurdistan Workers’ Party) “comrades”, both men and women, who used to go from house to house, spend one night in each home, in order to raise awareness of their ideas in the general population. We have a lot to learn from this immersive strategy. Perhaps it owes something to the nomadic tradition of the Kurdish people. Whatever its origins, it is a tradition that Kongira Star continues by moving guests from house to house. In the ten days that I was there, the act of packing and repacking every day led to me being parted from my phone, my tablet, my camera, my notebook – all of which I was re-united with once I had retraced my steps. In the main office of Kongira Star, behind the president’s desk, hangs a portrait of Abdullah Öcalan, leader of the PKK, held in a Turkish prison since 1999. On the facing wall, is a portrait of Sakine Çansiz, the woman co-founder of PKK who was shot dead in 2013 in Paris in an execution-style killing. I find this order of preference disquieting for a women’s organisation. The document describing the work of the organisation opens with a quote from Öcalan, the ‘Revolution that fails to liberate women is not a real revolution, and the organization that cannot organize women is not a real one.’ Of course, we should give Öcalan credit as the first ‘freedom fighter’ or revolutionary leader to place women at the centre of his revolution and to argue that the enslavement of women was the start of all other forms of enslavement. However, this feels like hero worship. Even though portraits of leaders are plastered in official places in many parts of the world, the cult of personality which is disavowed by revolutionary movements but nonetheless flourishes harks back to what happened in places like the Soviet Union. The booklet lists the Administration’s extensive legislative assault on patriarchal practices: Child marriage, forced marriage, dowry and polygamy have been banned; any attempt to stop a woman marrying of her own free will, will be prevented; honour killings, violence and discrimination against women have been criminalised; women, regardless of their marital status, have been given the right to custody of their children until the age of 15; a woman’s testimony is equal to a man’s; a woman has a right to equal inheritance; marriage contracts will be issued in civil courts. Impressive work when you consider that the women’s ministry was set up only in January 2014. Sharia courts, in which women always get a raw deal, have been disbanded. Although Bashar al Assad claims to be committed to secularism, Syria has always had a network of religious courts to deal with personal law of the various denominations. In Rojava, there is a clear understanding of the need to keep religion out of the public sphere in a way that is far more advanced than even the UK. We have Muslim Arbitration Tribunals, sharia councils and Beth Dins (Jewish religious courts) in this country. Although their judgements are meant to be compliant with British law, I have written before on 50.50 about the ways in which they fail women. The example of Rojava teaches us humility; not to assume that the Middle-East is an unremittingly conservative place and not to assume that the modernity associated with Western culture, especially capitalist modernity, is more likely to deliver a just and equal society.